"This is my Grandmom's recipe - she taught me when I was small how to make it. I guess that makes it a family recipe, although I have changed it a little to fit my style of cooking. You may decide to change something or leave it. Enjoy!!! Has cranberries and nuts in it too!" Didn't really like it. Not sweet enough. The cranberries made it really sour. It was too chunky after everything was put together. Probably won't make this again without tweeking it quite a bit. 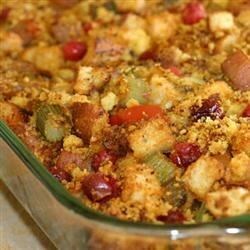 This stuffing recipe is delicious. I left out the orange and walnuts, and used sauteed celery and onion instead of the celery seed. Delicious! my Dad used to put sausage in the stuffing all the time, so yummy!